The epic bus ride from Mendoza to Santiago brought me to one of South America's most modern and beloved capitals. Santiago is often praised for its idyllic location, surrounded by snow-capped mountains easily visible from the city. In terms of natural beauty, I was curious to see how it stacked up to Medellin. I took a taxi from the bus station to the Bellavista Hostel, which featured some of the most comfortable bunk beds, complete with down comforters, I've ever experienced. 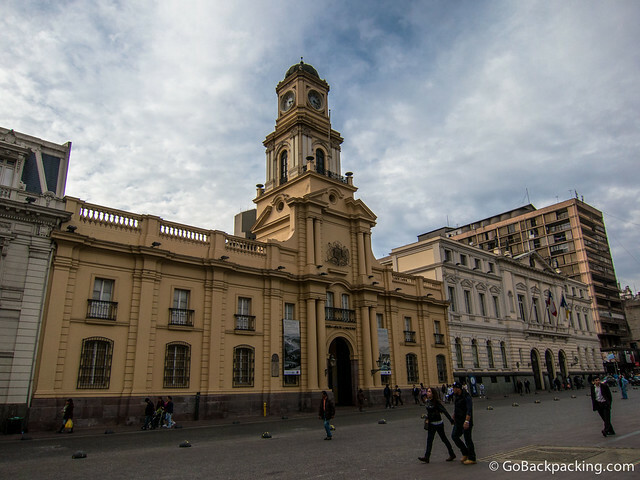 As I continued to make my way back to Lima for a scheduled trip into the Peruvian Amazon, I was forced to give Santiago four short days. Despite the rush, I managed to see quite a lot. My top priority after catching a good night's sleep was to check out the bohemian neighborhood of Bellavista. Upon leaving the hostel, I immediately began to notice lots of excellent graffiti. In Patio Bellavista, an outdoor mall featuring a variety of bars and restaurants, I jumped on the opportunity to eat fresh sushi for lunch. There was something of an (imported) salmon shortage in Buenos Aires during my stay, but since Chile is one of their main suppliers, it was a non-issue in Santiago. The salmon nigiri at Fukai was the best I'd had since leaving Lima a few months earlier. After lunch, I continued to walk around the neighborhood, taking in the vast number of discotecas that lined the streets. This was my kind of neighborhood, and I could picture myself spending a lot of time in Bellavista if I ever chose to live in Santiago. 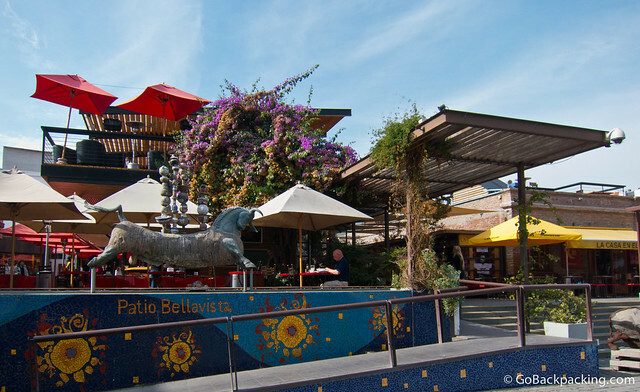 In addition to a happening restaurant and nightlife scene, Bellavista is also the point of access for a funicular leading up to the top of Cerro San Cristobal. At an elevation of 880 meters, it's the second highest point in the city. Open Mondays from 2 PM to 7 PM, and the rest of the week from 10 AM to 7 PM, a roundtrip ride to the top costs 1,800 Chilean Pesos ($3.75). Half way up the hill, you can get off the funicular and visit the National Zoo of Chile for an additional 3,000 Chilean pesos ($6.30). The way in which the zoo is built into a hillside reminded me of the zoo in Banos, Ecuador, and the Darjeeling Zoo in India. Highlights include a white Siberian tiger, African lions, and jaguars, but if its scenic city views you're after, it's best to head straight for the top of the hill. 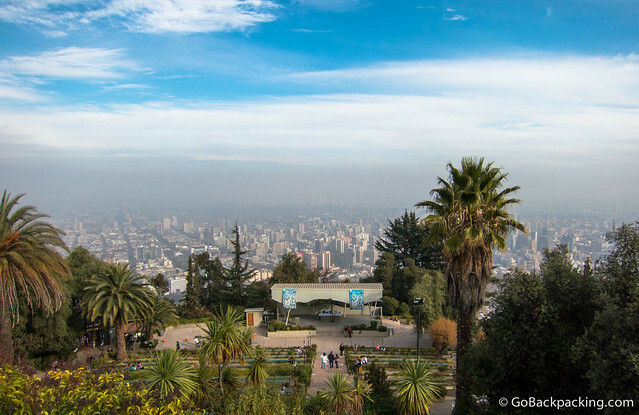 Once you reach the top, you'll be treated to sweeping views of Santiago, although if you're in the city any time but Summer, or after a heavy rain, don't be surprised if that view is disrupted by a blanket of smog. The summit also features an amphitheater, sanctuary to the Immaculate Conception (a little church), and a large white statue of the Virgin Mary. Pablo Neruda is Chile's Nobel Prize-winning poet. 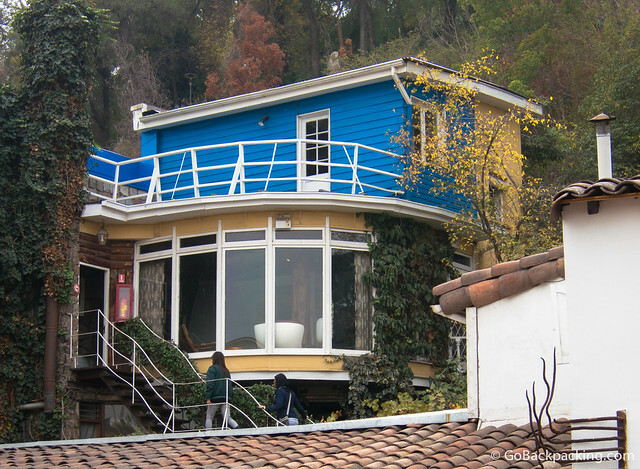 One of his homes, La Chascona, is also located in the Bellavista neighborhood, a few blocks from the funicular. I wasn't familiar with Neruda before arriving in Santiago, but found the guided tour of his home to be both interesting, and well worth the 4,000 Chilean peso cost ($8.40). In particular, he purposefully designed his homes to resemble boats. Later, I would visit La Sebastiana, another of his houses-turned-museums, in Valparaiso. Pablo Neruda has been in the news recently, as his body was exhumed in order to determine whether he was poisoned, as some believe, or died from natural causes (prostate cancer). If you can tear yourself away from Bellavista, I highly recommend the Museum of Memory and Human Rights, which opened January 11, 2010. For starters, the architectural design of the museum is unlike anything I've ever seen. A large green rectangular box sits on two concrete pedestals to form a bridge of sorts. 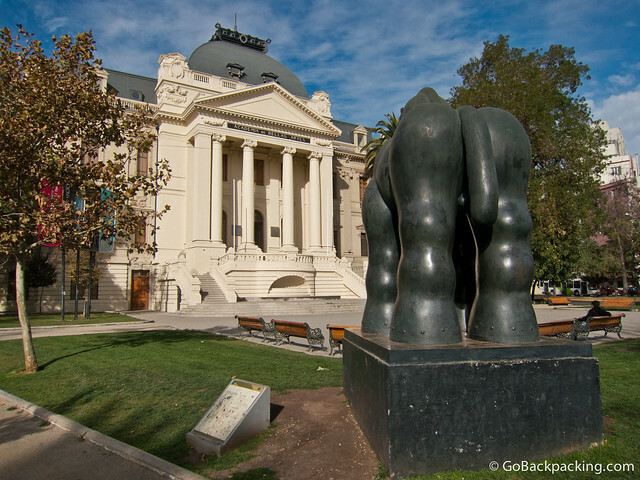 The museum commemorates “the victims of Human Rights violations during the Military Regime led by Augusto Pinochet between 1973 and 1990″ (Wikipedia). As an outsider, unfamiliar with Chilean history, I found the museum to be eye-opening. In addition to tourists, there were numerous school children there to learn about these tragic events. The Plaza de Armas forms the historic city center of Santiago. The large plaza features the Metropolitan Cathedral of Santiago, the Central Post Office, and the National History Museum, among others. I consider any central plaza of a capital city a “must see” but I didn't find this one to be especially attractive, or interesting. 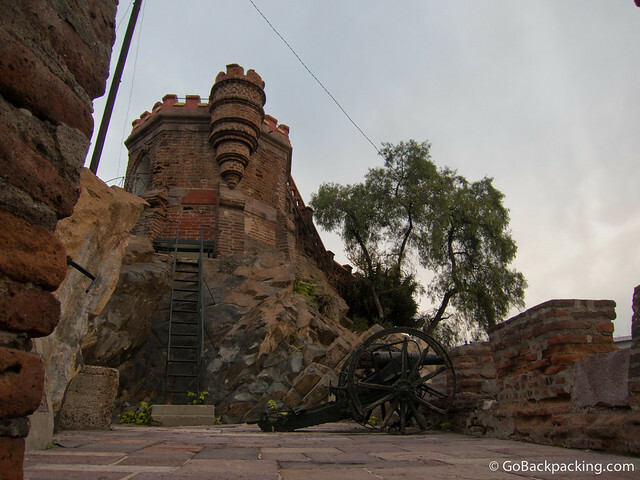 For a different perspective on the city, climb up Cerro Santa Lucia. At 629 meters, it's a few hundred shorter than Cerro San Cristobal, and its location closer to the city center allows for better views of Santiago's modern skyscrapers. I climbed the hill's many stony stairs at sunset, only to find a yellow smog obscuring the views. 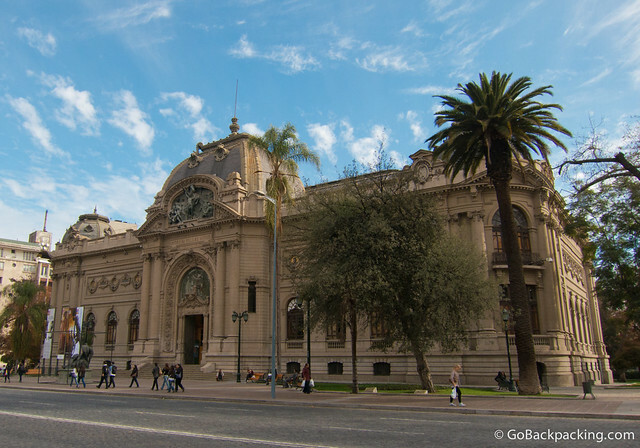 Inaugurated in 1910, the National Fine Arts Museum features a fantastic architectural design, both on the outside, and within. The 600 peso ($1.25) entrance fee makes it accessible to visitors of all budgets, and it's worth taking a peek inside the grand hall, which is lined with sculptures. The grand hall is the only room where photography is allowed. 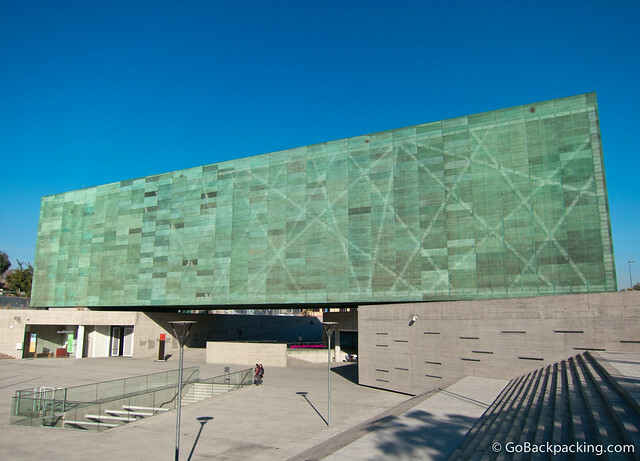 Located in Parque Forestal, behind the Fine Arts Museum, is the Museum of Contemporary Art. The entrance is marked by a giant horse sculpture by Colombian artist Fernando Botero, and the entrance fee is the same, 600 peso ($1.25). 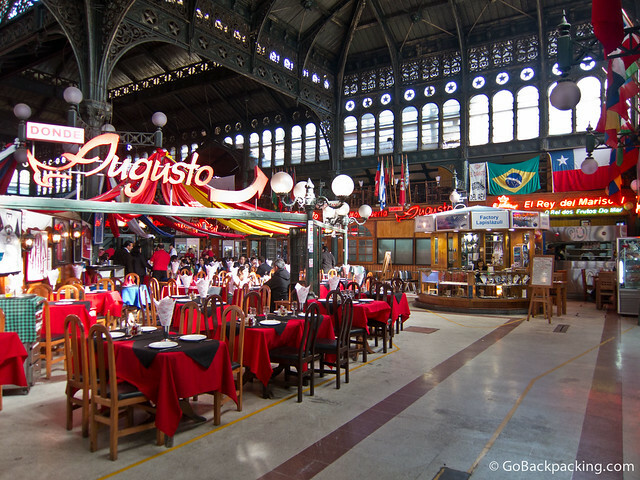 Foodies should make it a point to stop by the Mercado Central for lunch or dinner. Santiago's chaotic seafood market is a mix of fishmongers selling the fresh catches, and the restaurants that cook 'em. It was recommended that I grab lunch at Tio Willy's restaurant, which was not located in the main hall (pictured above). I ordered swordfish, with a side salad, for 6,980 pesos ($14.60), but I wasn't impressed, and wished I'd eaten in one of the bigger restaurants like Augusto, which offered more in the way of atmosphere. For more foodie favorites, check out Anthony Bourdain's No Reservations: Chile (Season 5, Ep.10). The Parque Las Esculturas was one of the last sites I managed to squeeze in before boarding a bus to Valparaiso on the coast. It was also one of my favorites, and you can't beat the cost (free). I lucked out with beautiful blue skies, which made walking through the park all the more enjoyable. The park doesn't seem to make the other top 10 lists that are out there, but I'd highly recommend a visit. On a clear day, you'll also have nice views of Cerro San Cristobal. Did I miss something? What's your favorite thing to do in Santiago? Excellent guide, Dave! 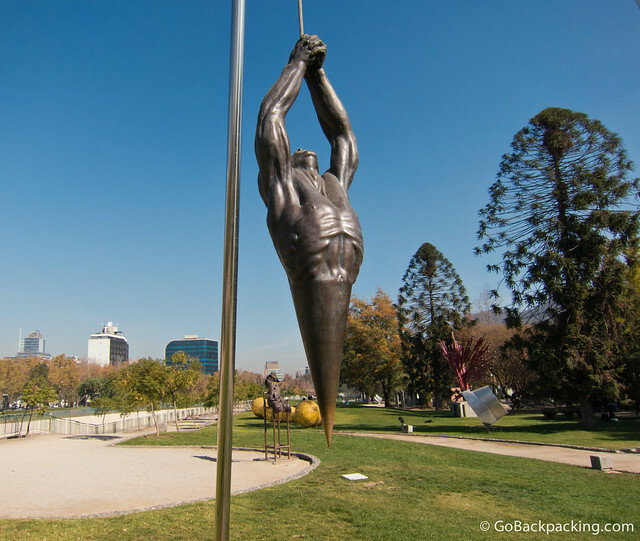 Happy to see the Sculpture Park on your list – we really enjoyed it, but as you say, it’s not on many people’s list of things to see in Santiago. But where are the Cafe Con Piernas? ;-) (http://globetrottergirls.com/2013/01/quirky-chile-coffee-with-legs/) Also, we loved how different Barrio Brazil and Yungay felt from the rest of Santiago – still very old-fashioned and colonial, worlds apart from Providencia or El Golf. Santiago looks like a super cool city! Shame we won’t be visiting it this time on our South America trip – next time, eh?! Seems Santiago is well known on its most extensive subway system. I think I will enjoy Cerro San Cristobal place, thanks for sharing these list so I can add it up on my itinerary. I leave this page its a little program about the attractions in Santiago a magic place! My son said it is very beautiful in Santiago great people,too good food and lodging God Country one of them that is ! Great place!! Thank you for your tip..going there at the end of the month and I am using your tip as a Guide!! Cheers.